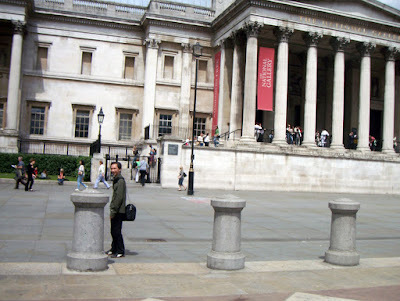 When Vince and I went to London for our honeymoon, my biggest regret was not setting aside an entire three days for the National Gallery. We spent just three hours instead and then we had to catch the plane to Manila. We missed our plane but you can read more about London here (although back then, my posts were mostly written in Taglish). This is a huge painting. It's bigger than my house, I think. 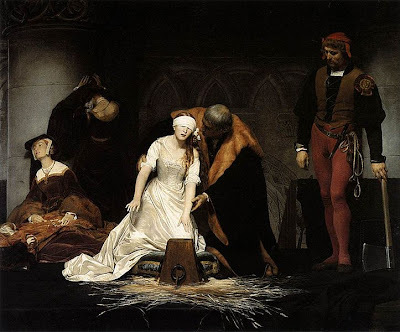 This depicts the tragic conclusion of the life of Lady Jane Grey, Queen of England for a mere nine days. She was the grandniece of that notorious Henry VIII (he of the six wives) and though she was royalty and had the best life had to offer, she didn't have her parents' love. Their ambition was her undoing. I won't do a history lesson here but I just wanted to say that this was my favorite painting in the precious few hours we spent at the National Gallery. Vince and I stood before this painting transfixed. It is absolutely stunning--the alabaster of her skin, the satin of her gown, the way she fumbled about for the chopping block, the gentle way she was assisted to her death, the distress of her maids, the calm of her executioner. And she was but 19 years old. Poor thing. The painting is magnificent and Lady Jane truly does inspire some of the most remarkable art. WendyB, my gorgeous blogger friend who I admire and adore, has created a pendant inspired by the tragic Lady Jane. 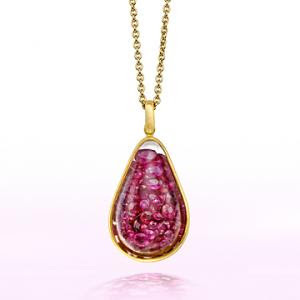 Within the rock crystal teardrop are rubies, symbolizing blood and tears. It's one of the most beautiful things I've ever seen. And I want it! I'll have to earn tons of money to afford it, however, but I've already put that photo on my dream board and whatever I put on that board, I get! 1. Interested in Jane's story? WendyB has a fun and easy post about her. Click here! 2. The necklace is about PHP 300,000. (in front of that magnificent painting) crying my heart out as well, hu!hu! * So sad yet so beautiful.